For most of my life my bookshelf was lined with books by theologians or Christian authors who were all white and all male. They were the leaders whom my pastors looked up to and by whom they were taught, so I followed suit. But as I’ve grown in faith, in my cultural identity as a Korean-American woman, and in my awareness of racial injustice, I realized I had been missing out on the beauty of diverse voices. I had only tasted and seen a sliver of God’s kingdom, and I was hungry to learn from authors, teachers, and preachers who weren’t all white and all male. Last year, I made it a goal to intentionally read books written by writers of color, and I am better read, better fed, and deeply grateful for the ways my eyes have been opened and how I’ve seen more of the fullness of God. 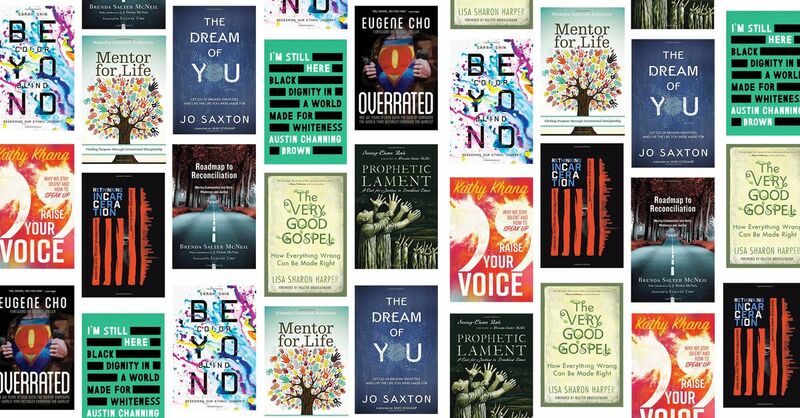 I’ve curated a list of 10 books by people whom I look up to, who are discipling me through their words, and I hope you will read at least one of these books this year. In this new release, Sarah Shin, fine artist painter, speaker, and trainer in ethnicity and evangelism, writes on going beyond the limited approach of claiming colorblindness and shows how our brokenness around our ethnicities can be restored. She helps us understand how our Christian and ethnic identities intersect and teaches us that becoming more aware of the significance of our ethnicity helps us become more effective witnesses of the gospel. Learn more and purchase Beyond Colorblind: Redeeming Our Ethnic Journey here. Lament is the appropriate and necessary response to suffering and injustice. Unfortunately, it is often missing in the American church. In this book, professor and author Soong-Chan Rah writes a commentary on the book of Lamentations and calls us to repent, to lament with those who suffer, and to engage in justice with hope. Learn more and purchase Prophetic Lament: A Call for Justice in Troubled Times here. Author and speaker Jo Saxton invites us to reflect on our lives and the dreams we once had for ourselves. Her poignant question, “Who were you before anyone told you who you were allowed to be?” points us to think on how we’ve exchanged our God-given identities for one that’s based on the lies and brokenness we’ve been told and experienced. God created us fearfully and wonderfully and with a voice, and He wants to redeem our stories so we can reclaim His dream of us. Learn more and purchase The Dream of You: Let Go of Broken Identities and Live the Life You Were Made For here. Dominique Gilliard is an activist, speaker, and director of racial righteousness and reconciliation for the Love Mercy Do Justice (LMDJ) initiative of the Evangelical Covenant Church (ECC). In his debut book, he writes on mass incarceration, the unjust and biased criminal justice system, and how the church has contributed to these problems. He shows us how we can practice God’s restorative justice and be a part of redeeming the incarceration system we have in our nation. Learn more and purchase Rethinking Incarceration: Advocating for Justice That Restores here. Professor and thought-leader Rev. Dr. Brenda Salter McNeil is passionate about equipping Christian leaders to practice reconciliation, and this book is a practical and helpful source for this endeavor. As our eyes are opened to the injustices in our world, it can feel overwhelming to know how to go about the work of reconciliation, and without guidance we can easily become short-sighted in our efforts. Thankfully, Rev. Dr. Brenda Salter McNeillays out the steps with reflection questions and exercises in each chapter to lead us toward unity and justice in our lives, our churches, and our organizations. Learn more and purchase Roadmap to Reconciliation: Moving Communities Into Unity, Wholeness and Justice here. Lisa Sharon Harper is a writer, speaker, and founder and president of FreedomRoad.us. She is committed to bring “common understanding, common commitment, and common action toward a just world.” In this book, she unpacks what it means for the gospel to be very good in the world today. For example, what does it mean for it to be good for the marginalized, for the ones who are stuck in a broken system set up against them? In one word, it means shalom- equity for all and peace, restoration, and wholeness for this world. Learn more and purchase The Very Good Gospel: How Everything Wrong Can Be Made Right here. Eugene Cho, founder and lead pastor of Quest Church in Seattle, confesses, “I like to talk about changing the world, but I don’t really like to do what it takes.” Isn’t that how we all often feel? We love the idea of being used by God or participating in His world-changing work, but we balk at getting our hands dirty with it. Eugene Cho challenges and shows us how to move from merely saying we’re going to create the change we want to see to actually doing it. Learn more and purchase Overrated: Are We More in Love with the Idea of Changing the World Than Actually Changing the World? here. Natasha Sistrunk Robinson is visionary founder of the nonprofit, Leadership LINKS, Inc., a leadership consultant, and anti-human trafficking advocate. In this book, Robinson frames mentoring within small communities in the church as intentional discipleship for God’s kingdom. She combines her experience in the military and business world to give us practical wisdom on how to do so. Her book is vital for the crisis of discipleship we’re experiencing now in the American church. Learn more and purchase Mentor for Life: Finding Purpose through Intentional Discipleship here. Writer and speaker Austin Channing Brown is passionate about racial reconciliation and justice and has written for various publications, including Sojourners Magazine and Relevant Magazine. Her forthcoming book is about her journey “to learn what it means to love blackness” after having grown up in majority-white schools and churches and about confronting how Evangelicalism played a part in the growing racial hostility in our nation. Learn more and purchase I’m Still Here: Black Dignity in a World Made for Whiteness here. Kathy Khang is a writer, speaker, and activist, whose expertise lies in issues of gender, ethnicity, justice, and leadership development. In her forthcoming book, she discusses how it can be hard to speak up, how our voices can be silenced or marginalized by factors of race, ethnicity, and gender, and what we can do about it. She helps us find and steward our voices to uniquely and authentically express God’s heart to others. Learn more and purchase Raise Your Voice: Why We Stay Silent and How to Speak Up here.